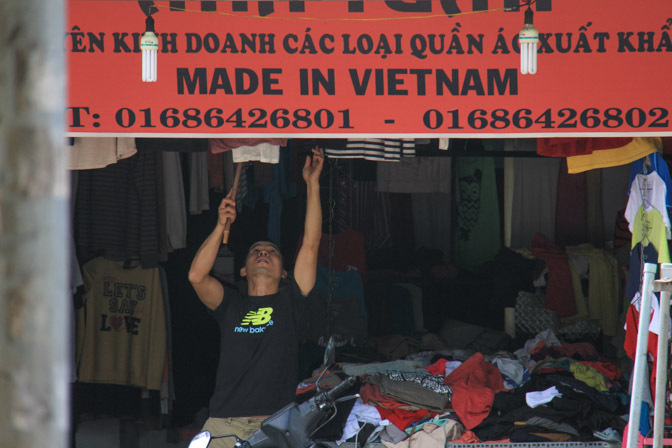 A Rant About Vietnam: Everything is so Cheap...ly Made. Home » Asia » Exploring Vietnam » A Rant About Vietnam: Everything is so Cheap…ly Made. When I first came to Vietnam, I couldn’t believe how inexpensive everything was. A rolling pin for 35,000 dong? Hell, let’s get two — one for cooking, one for chasing overly cocky paperboys with. Then, somewhere between being zapped by my own bug zapper and a ruined meal due to a pepper shaker’s lid not staying on, the age-old expression came to mind: you get what you pay for. In Vietnam, everything is cheap and everything is cheaply made. The country is basically a giant dollar store. Either they don’t have inspectors, or they just don’t give a damn. I’m quite sure the stores that sell this crap don’t care. One place I went to had a shelf on display that was very rickety. I had a quick look at it and saw that only a few of the screws were put in. I figured they just threw it together to display it and didn’t worry about putting all the screws in since it wouldn’t be used anyways. I bought one, brought it home, and started to put it together. It turns out the screws weren’t put in because the holes weren’t drilled properly. I could only manage to get 6 out of 12 screws in, and now I have a shelf that can only be used to hold feathers and tissue paper. I’m convinced that the store knew what was up, but they sold it anyways. I’d ban the place, but if I banned everyplace I got ripped off at I would end up having to buy everything in Singapore. Perhaps Vietnam is exporting all of their quality goods to the western world. In 2013 they exported $128.9 billion worth of goods — 17.8% of that was to the United States. Have a look at the tags on your clothing, America. You’ll probably see made in Vietnam a few times. First you melted the faces of innocent Vietnamese villagers, and now you’re forcing them to wear sub-quality tee-shirts? Damn you, USA! Really enjoyed your last two Mondays! What a great way to start the week.